With full profiles over much of south-eastern Australia, early and adequate crop nutrition should be part of the plan to get the crops off to a good start. The soil N status will be quite variable, with water-logging and leaching losses balanced against higher mineralisation in the wet and warm soils and losses by weeds. Soil testing is even more important in this season because of these uncertainties. Where N test values are low, added N at seeding will be need to get good crop establishment, but care needs to be taken with the placement of seed relative to fertilizer bands. At sowing and in-furrow fertilizer placement is an effective crop production management practice, but germinating seeds are susceptible to damage from fertilizer if placed too close or at high rates. There are many factors that contribute to crop damage due to fertilizers and in general, the amount of fertilizer that can be safely placed with seed depends on several factors. Type of crop: Canola is particularly sensitive, and wheat is relatively tolerant. The general order of sensitively (most to least) among major grain crops are canola>Lentil>wheat>peas>barley>oats. Type of fertilizer: Fertilizers are relatively concentrated chemical compounds that can affect delicate germinating seeds in at least two ways. Salt Index: Fertilizers are salts, and these salts can affect the ability of the seedling to absorb water too much fertilizer (salt) and desiccation or “burn” can occur - which is an osmotic effect imposed by the fertilizer. Some fertilizer materials have higher salt index or burn potential than others. Salt index values are usually included in basic agronomic texts or are available from fertilizer dealers or extension resources. As a general rule, most common N and K fertilizers have higher salt index than P fertilizers, and sulphate forms tend to have lower salt index than other forms. To find out more about fertilizer salt index – see Calculating Salt Index (at left by JD Mortvedt). Ammonia formation potential of fertilizer: Fertilizers that have the potential to release free ammonia can cause ammonia toxicity to seed. Thus, in-furrow placement of urea-containing fertilizers is usually not advisable. In some cases UAN is applied successfully in-furrow, but there is a risk in this practice because of the potential for ammonia damage where high rates are used. Efficiency enhancers: Some strategies to enhance fertilizer efficiency, such as the use of polymer coatings or urease inhibitors will slow the rate of ammonia production and make these products less likely to cause crop damage. Soil type and environment: Soil conditions that tend to concentrate salts or stress the germinating seed increase the potential for damage. So, the safe limit for in-furrow fertilization is reduced with lighter soil texture (sands) and in drier soil conditions. Also, environmental conditions that induce stress and/or slow germination (e.g., cold temperature) can prolong fertilizer-seed contact and thus increase the likelihood of damage. Machinery Configuration: The type of point used and the spacing between the drill rows both affect the concentration of fertilizer near seed and so the likelihood of damage. Row spacing: For a specific set of circumstances (crop, soil conditions, etc.) safe rate of fertilizer per hectare increases as row space narrows. This is because closer row spacing has the effect of diluting fertilizer over the length of row. Twin Chuting systems: These systems have separate seed and fertilizer delivery chutes, either to different tynes or to different parts of the same tyne. These systems give separation of seed and fertilizer, placing fertilizer in bands to the side or below the seed bands. Separation of 3-5 cm is usually adequate to provide crop safety. Seed Bed Utilization: The more scatter there is between seed and fertilizer in the seed band or row the more fertilizer can be safely applied. 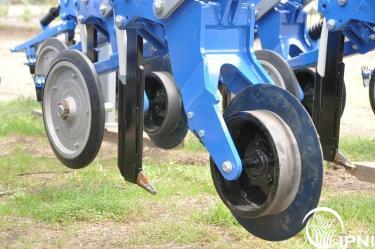 The type of planting equipment and seed opener influences the intima­cy of seed-fertilizer contact. The concept of “seed bed utilization” (SBU) has been used to address this factor. SBU is simply the seed row width divided by the row width, i.e., proportion of row width occupied by seed row. The wider the seed row for a specific row width the greater the SBU. As SBU increases so does the safe rate of in-furrow fertilization. While SBU is a useful concept, what it embodies is the potential for damage with particular crops and fertilizers sown at various row spacings with different machines. The tables below give a summary of the generally accepted safe in-furrow application rates of granular urea for wheat (table 1) and canola (table 2) using a two different seeding points and at three different row spacing’s on either light or medium soils. Seed bed moisture content is also an important factor, and damage is more likely with dry soils rather than moist soils. If the soils are dry or borderline, then rates should be at least halved from those in Tables 1 and 2. Table 1 –For wheat & urea –approximate safe fertilizer rates (kg of urea) for in-furrow application for two seeders at three row spacings on two soil types. This assumes a moist seedbed. Table 2 –For canola & urea –approximate safe product rates (kg of urea) for in-furrow application for two seeders at three row spacings on two soil types. This assumes a moist seedbed. For more fertilizer/crop/SBU combinations, see "Lookup tables for Fertilizer/Crop Combinations. IPNI in association is adapting the US developed the tool to Australian conditions. This tool - On-Line Damage Calculator is available at left. What about fluid fertilizers? There are few guidelines for in-furrow fluid fertilizer application with products, although the fertilizer damage tool does contain several fluid fertilizers. As a general rule for fluid fertilizers, apply the same rules for maximum N or P rates as for granulated (solid) products, based on a nutrient concentration basis. So urea/ammonium nitrate can be treated the same as urea, and ammoniated phosphoric acid the same as MAP. Placing Fertilizer in-furrow with the seed, by Mike Stewart, PNT, Spring 2008, Number 8. Seed Bed Utilization - How much seed placed fertilizer is safe under direct-seeding conditions?